Joseph Robinson, Jr., originally from Charlotte, NC, graduated from an inner-city high school in Harrisburg, Pa where he graduated with honors while serving as Captain of a very talented and highly regarded AAAA Basketball Team. He earned a B.A. degree in English from the University of Virginia. He later worked as a senior manager for 26 years with the Pennsylvania Department of Transportation before resigning to follow his passionate desire to inspire others to become an effective leader. His commencement address to middle school students preparing to transition to high school evoked a cheering and celebratory standing ovation. Why Should I Take the Lead? Joe speaks to the hearts and heads of students about personal responsibility and peer pressures that discourage effective leadership and achievement. He will inspire and entertain students with humorous anecdotes and stories that illustrate model student effectiveness. They will be challenged and encouraged. Making the Transition from High School to College. Joe will provide the students with the practical no-nonsense realitiies of what it takes to succeed as a college level student. He will discuss the 3 nouns of influence (people, places and things) and challenge the students to live by 5 key principles. This is by far Joe's most popular, insightful and entertaining high school presentations. 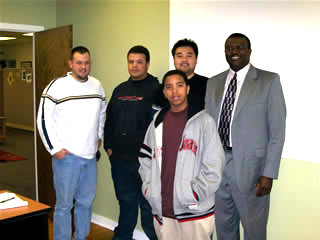 "What impressed me most was Mr. Robinson's delivery and style which immediately captures the attention of young people. As an educator, i am fully aware of the necessity of the charismatic delivery of information which young people seem to need to remain attentive. Mr. Robinson possesses these necessary qualities which in turn causes students (particular minority) to respond enthusiastically to his message. God bless you, Mr. Robinson! "